: : sorry for the absence folks. too many things these days. I'm loving anything in bright colors these days. And have always been drawn to big, bold patterns. 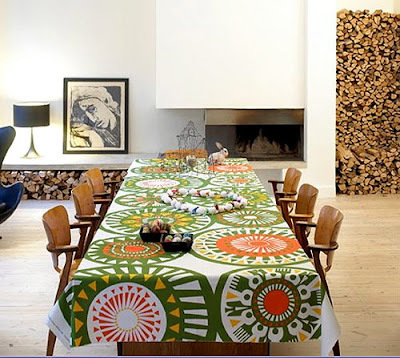 here a tablecloth by .marimekko. found via .stylefiles. I really like the painting (or drawing) in the background. Where's that from? Nice Nice. I just checked Marimekkos new spring collection fabrcs - so nice!